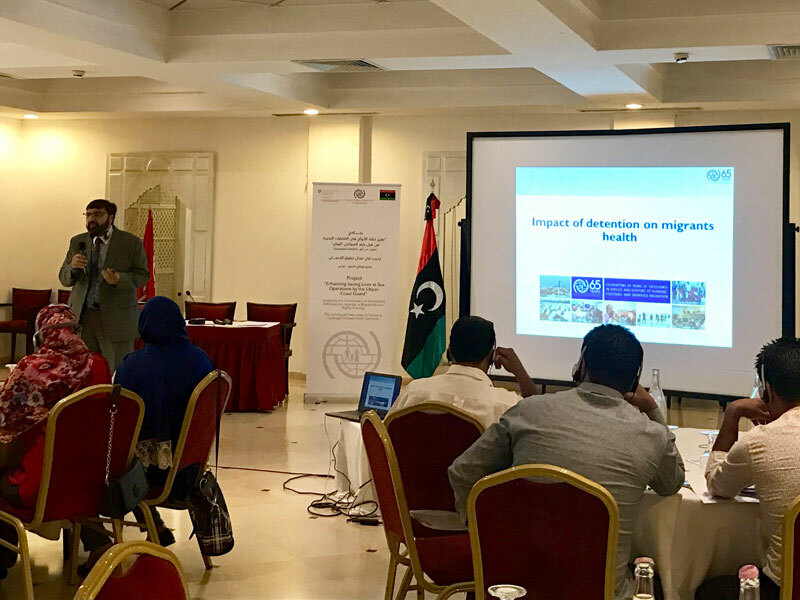 Tripoli – IOM, the UN Migration Agency, is currently holding a three-day training workshop focusing on human rights and identification of vulnerable migrants for staff of Libyan detention centres, the Libyan Coast Guard and other entities involved in rescue at sea operations. The training, based in Tunis, seeks to build the capacity of the Directorate for Combatting Illegal Migration (DCIM), Libyan Coast Guards (LCG) and other authorities to ensure that migrants are treated in a way that upholds their dignity and fully respects their human rights. Officials from DCIM, the LCG, the Directorate of Coast Security, and the Directorate of Passport Investigation participated in the training, which also included improving the officials' knowledge on identifying vulnerable groups and addressing their needs. Divided into groups, the participants were also given the opportunity to discuss Operating Procedures in order to enhance their referral mechanisms. “The aim of these trainings is to discuss and address coordination mechanisms among the government officials, particularly when it concerns human rights and protection, and how IOM can assist in strengthening their capacity,” emphasized IOM Project Manager Maysa Khalil. The training also included sessions on migrants’ rights; mental health and communicable diseases; the IOM Displacement Tracking Matrix (DTM); the links between human trafficking and smuggling, as well as external communication and protection. In addition to IOM, UNHCR and the Danish Refugee Council each contributed a session to the training. Most of the challenges raised by participants were linked to health and protection aspects, particularly in detention centres and during rescue at sea operations, as well as coordination of interventions by international actors. “One of the challenges we face is that the migrants are too often stuck at the disembarkation point following a rescue operation,” explained Reyad Altaweni, one of the participants from Zuwara. Altaweni agreed with IOM that the time migrants spend at the disembarkation points needs to be shortened. There is increasingly closer coordination with IOM which improves the humanitarian response in times of rescue at sea operations whereby rescued migrants are assisted with water, food and health assistance, Altaweni added. The trainings are part of the project, Enhancing Saving Lives at Sea Operations by the Libyan Coast Guards, which is funded by the Government of Switzerland. The project’s overall aim is to enhance saving lives at sea operations by providing lifesaving equipment, targeted infrastructure support and related capacity building.